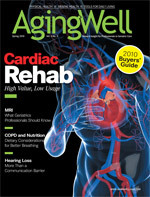 Medical imaging plays a crucial role in diagnosing and treating older adults. Many providers don’t fully understand key safety considerations for these exams and procedures. Medical imaging can be a lifesaving tool when it comes to diagnosing diseases and medical conditions. But as with any procedure, there can be some risk involved. This is especially true for older adults who may have special considerations that must be taken into account prior to undergoing imaging procedures, such as implanted pacemakers, aneurysm clips, or even difficulties remaining still during procedures. Older adults who have implantable devices are at the highest risk when it comes to MRI scans. “The M stands for magnetic and, considering implantable devices are metals with hardware, software, and electronic components, they can interact dangerously with a large magnet,” explains Anne B. Curtis, MD, FHRS, FACC, FAHA, a professor of medicine and chief of the division of cardiology at the University of South Florida in Tampa. Because some implantable device components may be sensitive to an MRI’s magnetic field, it can put the patient in danger. For example, Curtis explains, a pacemaker may interpret the electrical noise coming from the MRI machine as the heart beating. Because a pacemaker is a device that prevents a patient’s heart from beating too slowly, if the electrical noise is read as the heart beating, the device may interpret that it’s not needed and shut itself down. “If the patient needs the pacemaker during the procedure, that could be a very bad thing,” says Curtis. While an implantable device can put a patient undergoing MRI at great risk, the frightening reality is that many patients are unaware of the danger. In fact, a recent survey by the National Council on Aging found that four in 10 patients and their caregivers were unable to recall whether they had been advised regarding the risks associated with an MRI when they received an implantable device. Even more alarming, the survey also found that three in 10 pacemaker patients had undergone an MRI despite these risks. Among that group, nearly 20% reported experiencing problems with their devices following the procedures. “There was an older woman who was brought to the imaging center by her daughter, who planned to accompany her mother only during the prescreen. As the MRI staffer went through the questionnaire of what Mom had filled out, he noticed she had answered ‘no’ regarding having had any implanted devices. However, the staffer noticed some unusual hair growth patterns around the back of the skull and reiterated the implanted device questions, stressing that if she had had an aneurysm clip implanted, that it could potentially be torn out by the magnet. As this story highlights, it’s critical that patients are cognizant of their own medical history. And if they suffer from memory loss or other mental conditions such as dementia, then it’s crucial that primary caregivers not only be fully aware of their medical history but also become knowledgeable regarding the implications of that history for future procedures. While implantable devices represent one of the biggest concerns for MRIs, other considerations are critical to older adults’ imaging safety. Gilk recommends patients and their caregivers visit www.mripatientsafety.com for information on preparing for an MRI. While there are always risks for patients of any age, there are some special considerations that apply to elders who undergo an MRI. The best way to prevent potential risks for any procedure is to ask questions, says Paula Pate-Schloder, MS, RT(R)(CV)(CT)(VI), an associate professor of medical imaging at Misericordia University in Dallas, Pa. “There is data that proves that patients who ask questions have better outcomes. That is one of the reasons The Joint Commission established the ‘Speak Up’ campaign. If you or your client are being referred for a test, ask the doctor why. It always surprises me that patients don’t know why they are having a procedure,” she says. Curtis says having a discussion with the physician may lead to a new course of action. “There are alternative imaging techniques like CT scans, which sometimes will provide adequate information and are not a risk for an implanted device,” she says. In addition, Curtis says, an important message to convey is that if older adults need an implanted device, they should certainly get it. She says patients shouldn’t be deterred from obtaining these lifesaving devices because of a potential need for a future MRI. The key is awareness, not fear. “And this may be a given, but if you are already aware that you need an MRI, get those scans done prior to having the device put in,” she says. Pate-Schloder adds that things can change quickly in the world of medical imaging, so it’s important for patients and their caregivers to stay up-to-date. Just because a patient may have already had a particular test doesn’t mean he or she shouldn’t have a current conversation with their physician. But the best thing that practitioners and caregivers working with older adults can do is to encourage patients to be their own health advocate, says Pate-Schloder. “Encourage them to take charge of their medical care and to ask questions. Most hospitals have patient information pages on their Web sites that can be very informative.” She recommends visiting the American College of Radiology’s patient Web site at www.radiologyinfo.org for more information. It can help patients and their caregivers become more familiar with tests and develop a list of questions for their physicians. As with any medical test, knowledge is power and helping your patients and clients to be well informed will best prepare them for medical imaging procedures. • As MRI becomes more pervasive and more older adults have implanted devices, providers need to familiarize themselves and their patients with potential problems related to imaging procedures. • Pacemakers, cochlear devices, and internal clips can create problems in MRI. Physicians and technicians need to ascertain their presence and make appropriate determinations regarding their safety during procedures. • Older adults and their caregivers should be aware of their medical histories and provide information to imaging professionals related to any implanted devices. • Always encourage patients to ask questions. When alternative procedures exist in potentially risky cases, explore other options.